Steamed Dumplings (Zheng1Jiao3 蒸餃) are not that difficult to find in Taiwan, especially with one of the most famous dishes in Taiwan being the incredible steamed pork soup dumplings (xiao3long2bao1 小籠包). However, from my experience, the best place to eat XiaoLongBao is at DingTaiFung (鼎泰豐) and everywhere else just doesn’t step up to the plate. I actually heard recently that DingTaiFeng got its Michelin star taken away from it, but I guess that story is for another day. For today, let’s focus on this strange little place beneath a mall. If you walk down the stairs on the right of the picture, and turn the corner, you will be presented with this wonderful little restaurant, famed for it’s steamed dumplings and its sweet and sour soup. Now, these steamed dumplings have a little bit of a thicker skin to them than other ones I have eaten, but it certainly doesn’t detract from their fabulous flavour. All of the dumplings are hand made and you can watch them making them. They start by taking the skin, adding the meat paste filling into the middle, then folding and crimping them in place, ready for the steamer. The bamboo steamers, I feel, add a wonderfully traditional taste to dumplings or, indeed, anything steamed within. These dumplings are filled with XianRou, which is a pork filling. This is a staple throughout Taiwan, and it is what most dumplings are filled with (if not stated otherwise). The use of pork, and its fatty flesh, means that there are always plenty of juices inside this wonderful packages of flavour. The flavour of the pork is really nice in these, and as simple as they are in their making, they also are in their flavour. 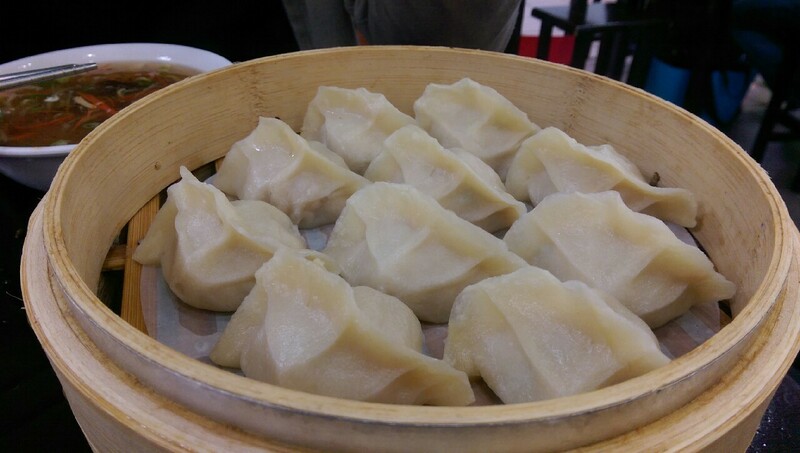 The steamed element means that they are healthier than other types of fried dumplings, but still pack a wonderful flavour. 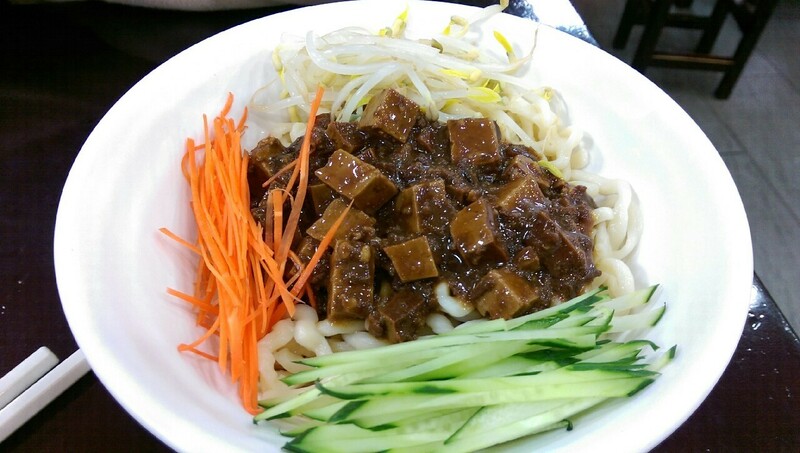 Here, we have the noodle dish (炸醬麵). 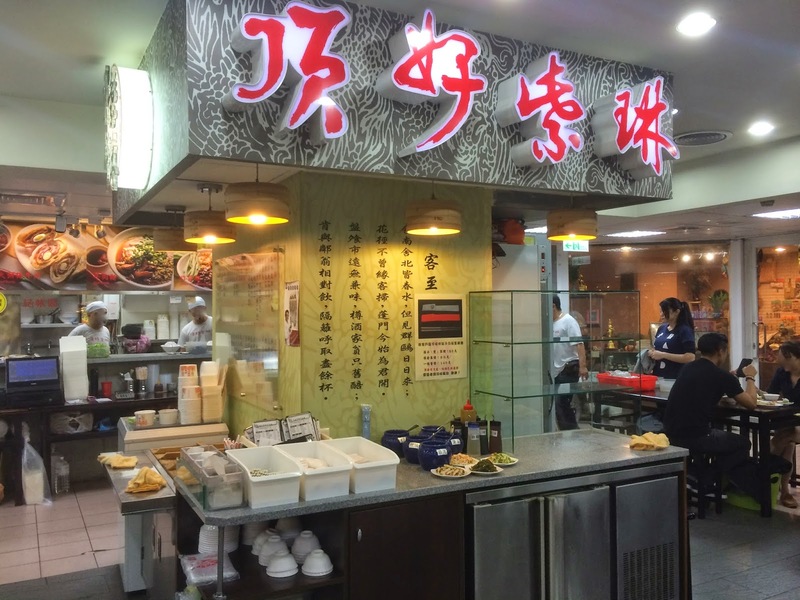 This is a regular noodle dish that you will find in a lot of the more traditional places in New Taipei City. It always comes with some nicely sliced cucumbers which add some freshness, in addition it will come with some finely sliced carrots, and also some fried bean and tofu cubes. All sat atop a generous helping of boiled noodles. The sauce on top is quite rich, so you do not get too much of it. The idea is to stir everything together and try and get the individual ingredients to blend together in one bite. The richness of the sauce plays nicely against the freshness of the cucumber and carrot, which plays nicely against the starchiness of the noodles. Everything balances out nicely, creating a well-rounded noodle dish. Nothing too fancy, but good, honest flavours. 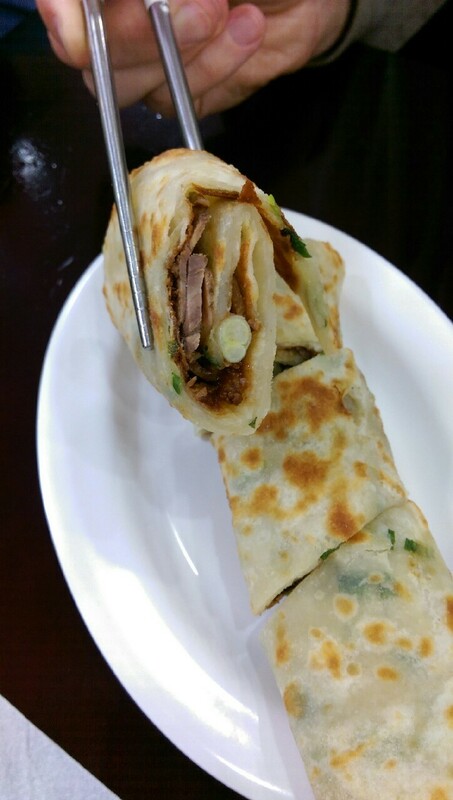 Here is the familiar Beef Roll (牛肉捲餅). Its a winner. Sometimes it can be dry and tasteless, but this one isn’t. The pancake roll is fried up fresh for you and the sauce inside is nice and tangy to go with the beef nicely. With the green onion punching a bit of a fresh flavour to run through the mouth – lovely. 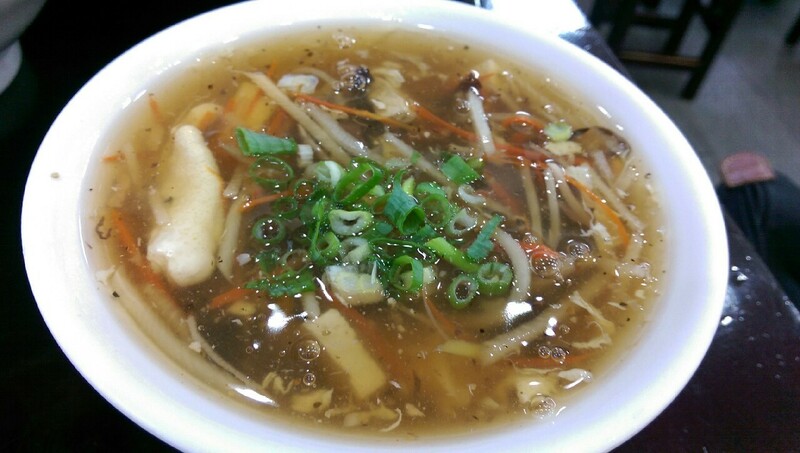 Here is possibly one of the most famous soups around Asia, not just Taiwan – Sweet and Sour Soup (酸辣湯). The Taiwanese version will often have slices of tofu, mushrooms, carrot and beansprouts. It is usually quite thick in consistency, which makes it quite filling. This version is quite sour, and not particularly spicy (unlike the Thai version). Its a good finisher for the meal, and a staple soup. This soup is slightly more special. 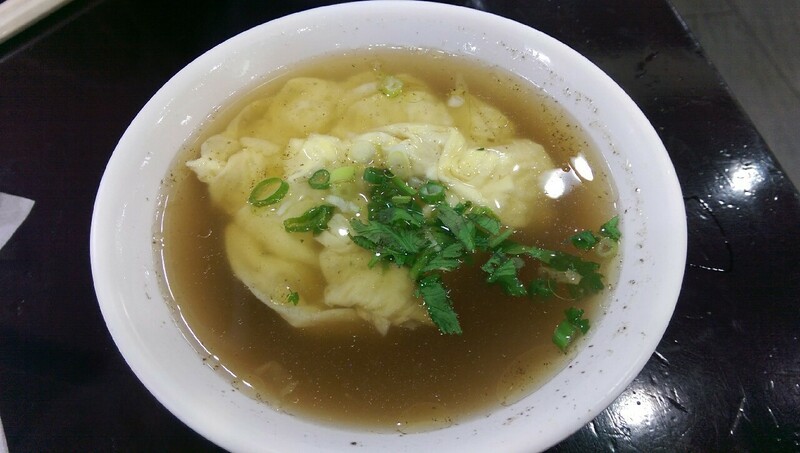 This is the Beef Egg Drop Soup (牛肉蛋花湯). The broth itself is a Beef broth, hence the name. The Egg is dropped into the soup maybe 30 seconds before being served, allowing it to still be nice and soft. The flavour is lovely, and the technique is so simple. It’s not too rich, too, so a good way to end the meal! 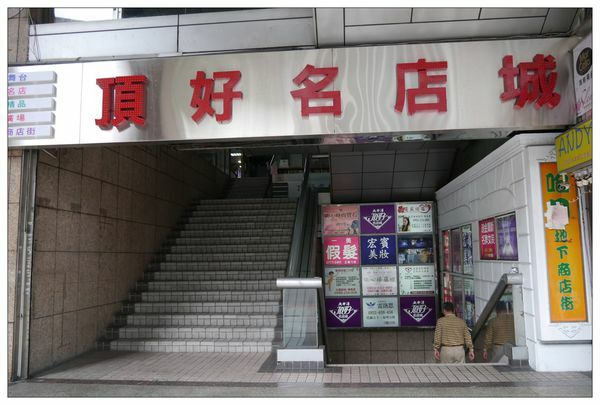 I would say that if you are in the area of ZhongXiao DunHua or ZhongXiao FuXing MRT stations, then this is worth a try. 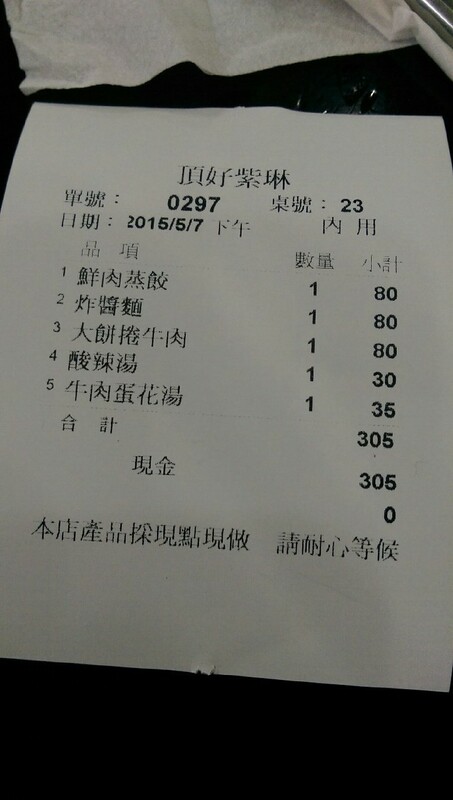 Its right in the middle of the two, and as you can see by the bill, it is fairly inexpensive. But as you can see by the pictures, the sizes of the dishes are more than enough and the food is really well prepared and presented! B1, No. 97, section 4, ZhongXiao East Road, Taipei City.